Cup of Java: Do you need a specialist or a generalist? 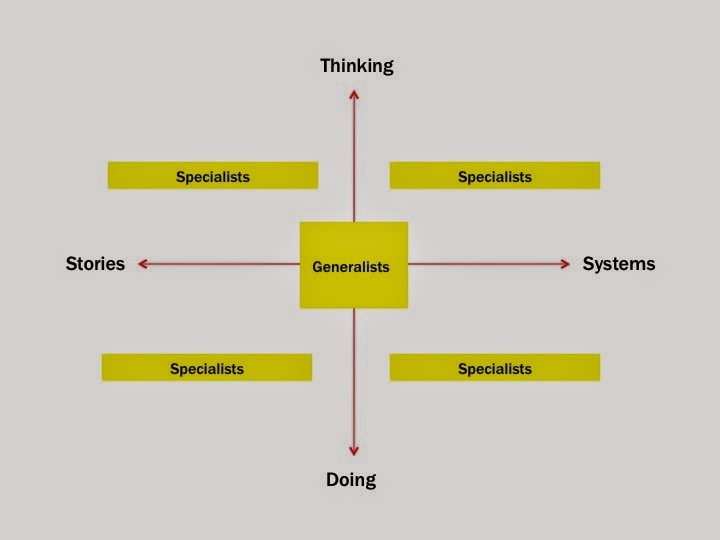 + Specialists vs. Generalists. This is not a new topic. But it's one that seems to pop up again every few years. Why? As agencies set up their yearly plans based on what their client needs are going to be, it becomes a staffing question for them. Reasons FOR GENERALISTS: When you need folks that are strategists, and in client-facing or leadership roles. They have a broad understanding of how all the pieces work and fit together. REASONS FOR SPECIALISTS: Expertise in creating, developing, and producing specific media is useful if you need someone who knows how to develop a mobile app, increase Search rankings, write a radio spot, or design a logo. More often than not these are makers. The funny thing is that I see more and more job descriptions out there for Creatives looking for both generalists and specialists. People who can see the big picture but then will sit down and understand all the nuances that go into producing something as particular as a mobile app (for example). 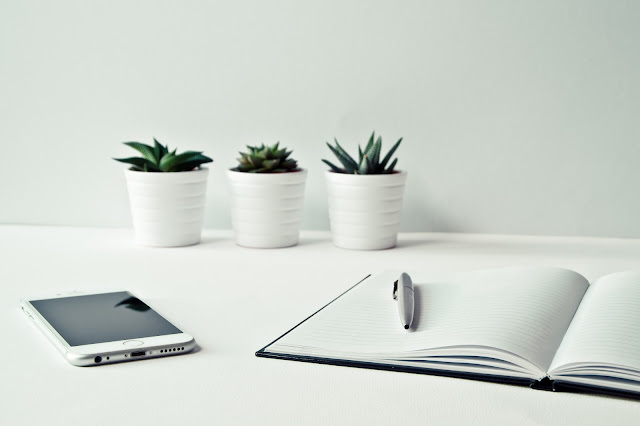 Is it a wishlist on the hiring manager, or perhaps it's more of a shift toward new skill sets needed for creatives that are both broad and yet, at the same time, singular. But isn't that like asking for something to be both a solid and a liquid at the same time? Sure, there are instances of great creative people who have skills where they are equally apt at being a generalist and a specialist, but are they the norm? Perhaps it's more of a evolutionary process. Often the methodology is for more junior creatives to be specialists and then migrate to a more generalist position as they climb up the corporate ladder. As one begins to oversee more disciplines and groups, a greater understanding of the whole machine and the larger picture is more important than a specific intricate working component. Those who inherently weren't paying as much attention to the industry as a whole ("why should I care about what accounts other agencies are winning or who won what at Cannes?") find there is a need to in order to grow the business, those underneath them and their clients' business. RG/A’s Bob Greenberg uses a framework of Thinking/Doing and Stories/Systems as a progressive way to think about essential agency competencies. 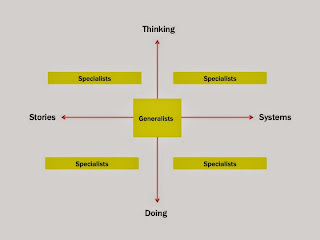 While the agency would have specialists in each quadrant of this model, the generalists would exist right in the center. In Greenberg's model, traditional agencies tend to lean to the left side, while digital agencies lean to the right. You can check out the "The Way Forward" presentation deck from the 2010 Mirren Conference. Being insatiably curious is the most important "skill" to have. Generalists have a very democratic approach to communication. Healthy agency cultures recognize that a writer could be the best photographer in the building, an account manager could be the most accomplished editor, or an assistant creative director could be the head of information technology at another agency. The capacity to work across disciplines should not only be nurtured, but demanded. Now to me, that first sentence is the most important part of the entire article. But it's true that specialists can be curious too. But when we start looking for e-commerce copywriters or annual report designers, there's something wrong. What we should be looking for are those with solid skill sets (can write, UX, design, etc), those who can think in interesting ways (conceptually and strategically), and who are curious and want to learn.